Many cavalry theorists of the 1840s and 1850s considered that the days of cavalry, especially armoured heavy cavalry, were numbered. The 'Beau ideal' for many, including British observers, were the French 'Chasseurs d'Afrique' who were trained as both light cavalry and as mounted infantry. Rifled muskets which had an effective range of 800-1000 metres meant the end of brightly coloured uniforms and were deadly against tightly-formed ranks of cavalry. Despite the assertions of Captain Louis Edward Nolan (1818-1854) in England, the Crimean War (1853-1856) showed that cavalry could not overcome well-formed infantry and that the cavalry charge was more deadly to it's own army than to the enemy. Often considered to have out-performed her Ally, the French cavalry came unstuck when attempting to attack two Russian artillery batteries during May 1855. Following the accession of General Pelissier to the French command, the army became more pro-active. In order to silence two Russian batteries which controlled the bridge over the River Tchernaya and the road up to Mackenzies' Farm, Pelissier sent two divisions of Infantry (Generals Canrobert and Brunet together with two cavalry brigades (Genrals Morris and d'Allonville) to silence the batteries and to secure the bridge and the valley of the Tchernaya so that the French army could advance into the Tchernaya Valley in order to access the water, the pastureland in the valley bottom to graze horses and control the access in and out of the valley. These two batteries were "Playfully called the Bilboquet and Gringolet, to express their [the French] contempt for the balls which they hoisted into their camp... " because they were firing at a very long range (estimated to be 1,000 metres) the French soldiers "watched them [the round shot] descending, stepped aside to let them pass and then dug them up to construct into trophies. After several months' firing not a man was hurt." "At the first light of day....the cavalry, moving at the trot, crossed the stone bridge at Tratkir, and after detaching several squadrons on the lower reaches of the river, in order to find and capture enemy outposts on the right bank, prolonged their movement on the road of Mackenzie. Soon, the battery which had been called the Bilboquet from the start of the siege opened fire with all its guns. The cavalry, turning quickly to the right, to avoid the fire, were ordered to the gallop up the slopes that led to superior positions occupied by the enemy. A deep fusilade welcomed them. They went resolutely forward, but were stopped by the uneven ground and arrangement of unknown land they met, foring them to suspend its movement." Marechal de Logis Charles Mismer of the 6e Dragons recounts how the Gringolet was "captured by a coup-de-main, in the African style"
Under the cover of darkness, at about 2.30am on 26 May 1855, the French advanced guards crossed the Traktir Brigde, surprising the Russian sentries. "The combat was not really serious. ... The expedition, conducted with spirit, was all done by the cavalry. We were launched with great rapidity on the enemy, because the infantry had arrived too late to take part. They only took part after we had returned. The Cossacks were surprised and fled after one of our batteries fired several shots into them. We passed over the bridges of the Tchernaya at the gallop, and mounted the hills and scarp of the right bank of the river with the same zeal. After thus chasing off the enemy, we returned to our post, after having re-crossed the Tchernaya." "We were ordered to leave our camp before Sebastopol on 25 May last. We left in a minute and were ordered to quickly march for the Tchernaya. The River Tchernaya flows through a magnificent valley and we commenced on its left bank. On the right bank, it is defended by a series of hills which the Russians have guarded with cannons. Our march was, naturally, very rapid because they [the Russians] instead of defending their batteries, are limbering-up their guns and moving-out, leaving behind a line of skirmishers to secure their retreat. So we did not run any sort of danger. The Tratkir bridge which we passed over was enfiladed by a battery, but we galloped on to escape it's fire, and my squadron was touched by cannon shots. The only serious danger was from a French battery, which, mistaking us for the Russians, fired on us two or three times, precisely at the rank of the officers. Luckily they saw their mistake and ceased fire before one man of ours was hurt. The coup de main was a beautiful as it was serious; it was executed by the 3e Escadron of the 6e Dragons of which I was a part.... It found a Russian embuscade at the foot of one of the hills situated on the right bank of the Tchernaya. This hill, on the bank of the river, is very steep, and crowned by a battery which our soldiers call the Bilboquet, a battery which fires into the valley of the Tchernaya and enfilades the Tratkir Bridge... The crest of this hill is, in addition to the battery, guarded by Russian soldiers, who gave a prolonged fire as we approached. The embuscade... departed in the direction of this hill. Our captain, who conducted us himself, had seen the day before how imperfect this position was. We departed in somberly and in silence, passing the Tratkir bridge without alerting the enemy, and the Bilboquet, which is silent, giving the alarm. After the bridge, we separate: the 3e Peloton sent round to the left; the 1e to the right; the 2e, which is mine, marches to the right to attack in front. The 3e Peloton is commanded in person by the captain.... After about five minutes, the captain sent a Sub-Officer who ordered me to leave the Peloton and with a few men take shelter in an arbour. During this time, the Russians had brought up troops to the crest and they fired on us: but the projectiles passed over our heads without doing us any harm.... Whilst the fire continued on the crest...."The Dragons won't be able to get up there," I thought; "it is a folly to think that." Alas they were not up there, but down on that hillock, trapped in a sort of funnel formed by two arms of the mountain, with the sabre, cutting, slashing, in the dark.The firing from the ridge, at all hazards, against them. They were struck down by chance in the middle of the night.The butchery was therefore held in the shadows in this hole we had not discovered, unless the accident took me there while I maneuvered the plain unnecessarily under the fire of Bilboqeut. Because of rage at not being able to do anything, and not wanting to return to the camp before the day I put my Peloton under fire from the battery, and could no maneuvering. But... I had neither killed nor wounded ..."
" The 3e Escadron of my regiment, where you will find myself and my friend Jaquillon, were in a serious affair. This Escadrib was ordered, at eleven o'clock in the night, to cross over the Tratkir bridge with the point of the sabre, by the night of the moon, and attack the outposts of the Gringolet battery. It was to be taken by a coup-de-main, in the African style. The mysteries of Gringolet and its surroundings were penetrated through a Lunette battery. They killed a few men; we killed a few in return; the affair could lead to another result. After several moments, we heard the clatter of sabres in scabbards, and hooves on soil. The appearance of the moon was saluted by a discharge of musketry. At the same time, the cannons of the Gringolet, added their voices to the fusilade. In a matter of minutes, but which seemed to us a very long time, ceased om the plain, but the cannon continued their fire from the hieghts. Soon, silence took its turn. After passing out of column, I came upon wounded men, among whom was my friend, two comrades of the saddle. In between his groans, he recognised my voice. He had hardly the strenght to reply to my questions. The ground was all broken-up, the horses were forced to walk. "Halt!" came the order, "Dismount." We tried to go forward on foot. "This is not working. Disentangle yoursleves. Back into the saddle." These were his last words. Several minutes laters, a poor widow lost her only son. This night affair was absolutely unncessary and was the death of many men and 30 horses. Only three Pelotons took part in this affair. The fourth, which got lost in a swamp, attempting it's march to turn the enemy's flank. This Peloton was commanded by a young officer, M. Silbert de Cornillon." Vanson further adds that the French infantry charged the batteries with “great elan”, taking the position with little loss. The Russian gunners were only able to get off three or four rounds before having to flee the battery. They found their escape cut off by the Chasseurs d'Afrique who came round the flank of the position, and took some fifteen prisoners. In conclusion, the French attack initially succeeded due to the speed and manoevrability of the cavalry. Attacking in open order and at the gallop so as to reduce the time spent under enemy fire they were quickly able to drive-in the Russian skirmishers and chase-off the Cossacks. 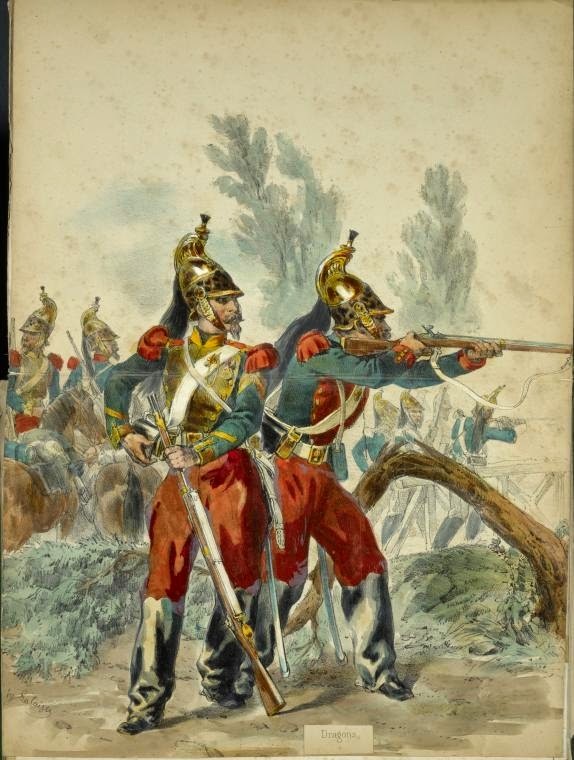 The French historian Auguste-Henri Dufour suggests that the attack on the fixed battery was a mistake: "The cavalry, in their ardour, carried on to the foot of the formidable positions occupied by the Batties of the Bilboquet and Gringolet..." In otherwords, the initial success of the Dragoons was their undoing and due to lack of command and control, the Dragoons galloped on up the slopes of the two batteries. Dufour, however, indicates that because the guns of the two batteries were uphill from their attackers, most of their shots actually went over the heads of the Dragoons because the guns could not be depressed sufficiently. However, unfamiliarity with the ground meant that one Peloton became entangled in marsh land, where they became pinned-down and unable to move, and the remaining Dragoons were forced to dismount because of the uneven, rocky nature of the ground. This not only reduced their element of surprise but also fighting strength as 'horse holders' had to be sent to the rear with the horses to look after them. 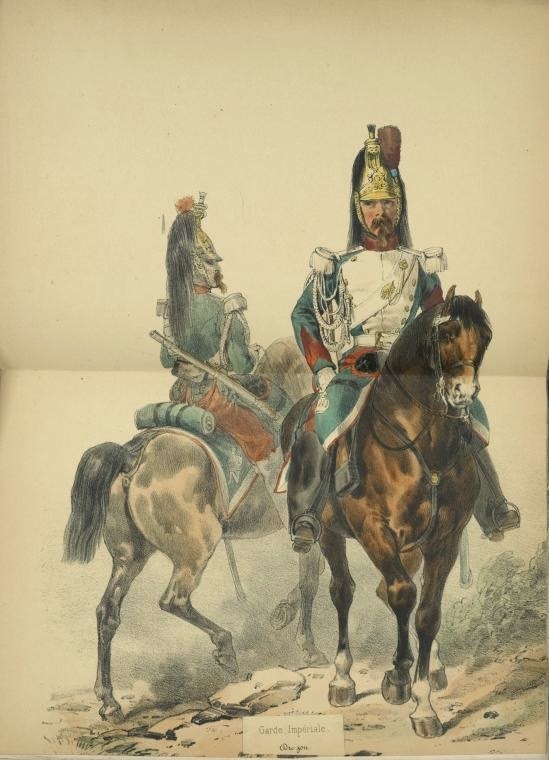 The French cavalry learned some hard, and vauable lessons in the Crimea, which confirmed much of current thought. 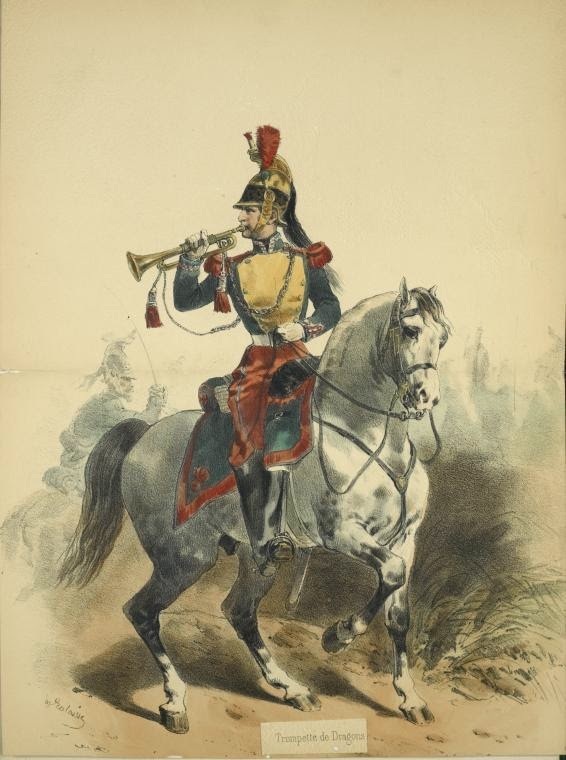 Whilst French dragoons were trained to fight equally well mounted or dismounted, the found that their brass helmets made easy tagrets, as did the coloured plastrons of their green habits. The plastrons were soon discarded and the helmets had white linen covers made for them but they also proved highly conspicuous, and so were died muddy-brown by being boiled in coffee. Their long sabres also proved an encumbrance when dismounted and their saddles were modified so that the sabres could be attached to them when dismounted. Despite having sent two regiments of Cuirassiers to the Crimea, the 6e and 9e, neither regiment saw any actual combat and they spent the entire campaign in reserve. The usefulness of heavy cavalry in a siege was indeed questionable, and as many cavalry writers pondered, given the changing nature of warfare, the 'breakthrough' where a charge by armoured cavalry against an enemy line was either unlikely or a futile gesture.